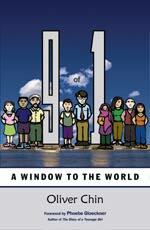 "9 of 1: A Window to the World" is a graphic novel in which nine fictionalized members of an 11th-grade class are given an assignment after the tragedy of Sept. 11, 2001. The students live in the Fremont, Calif., area and are students at James Madison High School. Matthew Pearson is their teacher for U.S. history. After Sept. 11 Mr. Pearson found it very difficult to engage his class in their regular lessons. The class was so distracted that he knew he must find a way to make history relevant for them right now. He assigned each student an oral report due at the end of the semester. They were to interview a complete stranger, someone they had never met. The person could be male or female but must be at least twice their age. They were to ask the people their opinion of the event known as "9/11." He told the students that even though they might disagree with the views of the people they interview, their job is to let them say their piece. Afterward they could evaluate where the person interviewed was coming from and why. Mr. Pearson told them they needed to become media critics. Because they were being bombarded with so much information, they needed to learn to analyze what they were seeing and hearing. They needed to question why some stories were covered and others weren't. Mr. Pearson booked field trips to local newsrooms, and the students interviewed the reporters about gathering information, primary and secondary sources, and balancing differing viewpoints. The students felt as if life would never be the same again. Some of them immersed themselves in routine things and usual activities to pass the time. Other students ignored the project as long as possible. As the students got out into the community and began interviewing people of diverse backgrounds, they discovered more than they bargained for and that "9/11" cannot easily be reduced to an "us versus them" mentality. Library Journal refers to "9 of 1" as an educational work. Publisher's Weekly describes the novel this way: "Half comic, half textbook and wholly readable, Chin's ‘9 of 1' presents a kaleidoscopic vision of the United States post-Sept. 11, a nation made up of countless immigrants encountering each other every day in the most ordinary ways." The novel contains a set of discussion questions for each of the nine interviews. Chin provides the reader with plenty of historical background and differing worldviews. Even though you will find viewpoints different from your own, it is a very interesting and eye-opening read. It is recommended for age 12 and up.